If you’re looking for luxury this festive season, then look no further than this outstanding five-star venue situated in London’s buzzing Leicester Square. You’ll enjoy exclusive hire of the venue’s decadent Penthouse Suite, located on the eighth floor of this glamorous property. The Penthouse Suite offers guests spectacular panoramic views across the city, where they’ll soak up iconic sights such as the London Eye and Big Ben. This year, the venue are offering guests the opportunity to experience a dazzling theme that’s set to impress. From James Bond and Star Wars themed evenings for movie fans and glamorous Masquerade Balls and Monte Carlo Casino nights for those seeking sophistication, guests will marvel at the striking theming and décor! For those guests that want to transport themselves back in time to the roaring 1920’s, then they’ll love the fabulous Great Gatsby party night, or alternatively why not try and solve the crime with a Murder Mystery night? For those that want to revel in the festive season, then the Winter Wonderland theme will be perfect. The venue are happy to discuss any bespoke party themes or ideas you may have and will turn your visions into a reality. With this excellent package, guests will be treated to a chilled prosecco reception on arrival, before indulging in a sumptuous three-course festive feast. Mineral water is also included, along with those all-essential festive novelties, so don’t forget to pull your cracker with your neighbour! Coffee and mince pies will be served to round off the dining experience in true Christmas fashion. After dinner, the evening continues with a DJ and disco, where everyone will be able to let their hair down and party their way into the early hours. Further entertainment can be included with your party night for an additional cost. 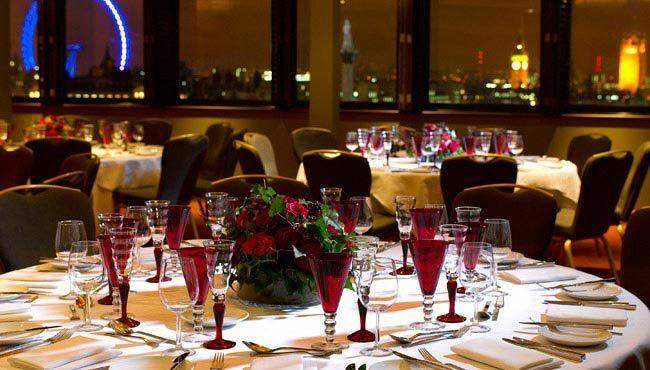 Book your luxurious Christmas party at this outstanding venue in Central London today!